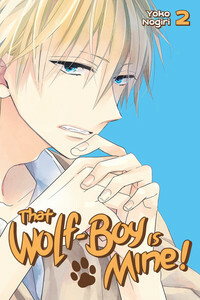 Title: That Wolf-Boy is Mine! Komugi's not sure what to expect when her family moves to the remote northern island of Hokkaido, and she starts at a new high school. But she certainly didn't expect a boy to come up to her and say, "Gee... you smell good, somehow!" That boy is Yu Ogami, and Komugi finds herself strangely drawn to him. But when she sees him in an unguarded moment, she discovers he's a werewolf! Now she has a choice to make: to keep his secret, or to ask for help and risk angering a wolf-boy? Story and art by Youko Nogiri.